The MAPP test comprises 71 different triads, or three statements. You simply choose which one you would most prefer or least prefer, with one left blank. Since there are so many different combinations of answers, there are literally more than a trillion different test results – more than there are people in the world. More than 3,500 partners, including career coaches, outplacement firms and school counselors, use the MAPP to gain insights and counsel their students and clients. However, the MAPP career test can be taken and read by consumers without having to engage the services of a professional. After completing the test, you can see your results immediately. But you won't want to stop there! 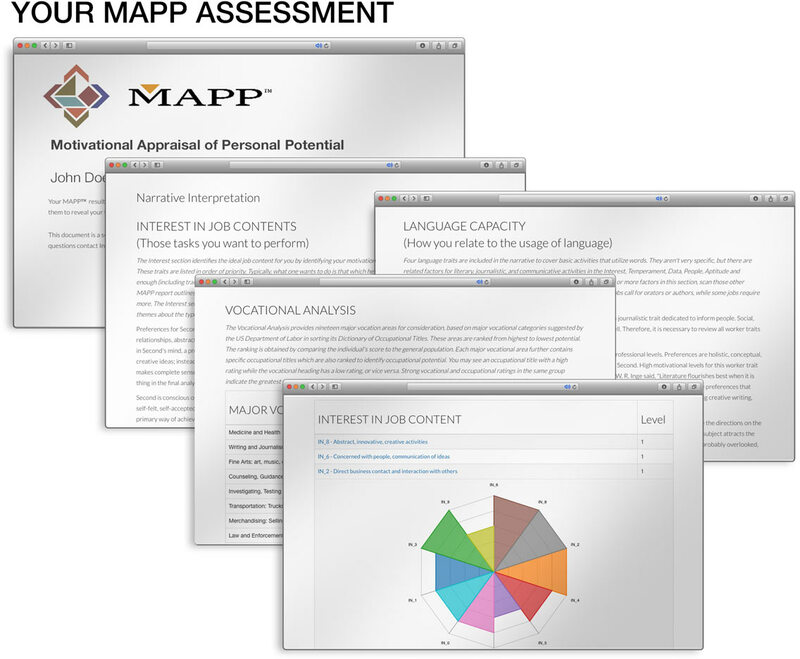 A MAPP Package can uniquely help you find your ideal career. Your personal test results are scored against over 1000 jobs, and you can see what jobs are the best fit, along with the education needed, career outlook and real job openings in your area.